Preet Banerjee does some detailed calculations to show how a lifetime of portfolios fees affect retirement income. He gives a clearly designed spreadsheet so that you can adjust the assumptions for your situation. Tom Bradley at Steadyhand found a new fund (not a Steadyhand fund) that charges a management fee not based on the usual percentage of investor capital but on the total amount of leveraged assets. So, if the fund has $600 million in investor assets and borrows $200 million more for leverage, the management fee is a percentage of the $800 million total. This is a pretty strong conflict of interest. Phil DeMuth at Forbes explains what’s going on when you get a pitch for active fund management. The appeal to your greed is strong. Jonathan Chevreau reports that iShares is dropping the fees on several of its ETFs. This is good news for investors. It’s not likely to entice me away from Vanguard, but any fee reductions are investor-friendly. James Cowan at Canadian Business calls for a ban on unpaid internships. The Blunt Bean Counter gives his take on what the relationship between your investment advisor and accountant should look like. He makes it clear that they don’t always work in unison. Mr. Money Mustache makes a strong pitch for metal rooves. They’re less expensive than I thought they would be. Big Cajun Man doesn’t think much of Disability Tax Credit advisors. Just the picture of the Big Cajun Man showing disapproval is worth the price of admission. My Own Advisor gives us his takeaways from Warren Buffett’s latest letter to Berkshire Hathaway shareholders. Canadian Capitalist wakes up just long enough to update the performance of his sleepy mini-portfolio. My wife and I have various assets such as our home and our savings. The question of who owns what can be surprisingly complex. The reason for this complexity is that there are three different points of view on answering this question. Here I look at our assets from each of these points of view. Our view of ownership is quite simple: 50/50 for everything. I know that some couples choose to have his and hers money, but that’s not how we do it. When it comes to paying for things, we decide who will pay based on convenience. If my wife needs some cash, I hand her some without bothering to do any kind of accounting. I think this works well for us because we are both quite frugal. Just because the ownership of our assets is 50/50 doesn’t mean that we each exercise 50% control of all assets. To pick a trivial example, I don’t touch her toothbrush. It might be 50% mine in an ownership sense, but in terms of control it’s 100% hers. This carries over to our bank accounts and trading accounts. I control 100% of the accounts in my name, and my wife controls 100% of the accounts in her name. We do have a joint account, but this is strictly so that my employer will deposit part of my pay in the account. I don’t touch this joint account and my wife would be justified in being upset if I did touch it without discussing it with her first. I know that some couples benefit from using the same joint account because it forces them to coordinate their spending and ultimately reduces wasteful spending. This is not our problem. I wouldn’t want to be uncertain about how much money is in my account if I misunderstood my wife’s intention to spend some money. She feels the same way about me mucking about in her bank accounts. This doesn’t mean that I can spend any amount from one of my accounts whenever I feel like it. The money is half hers in an ownership sense as we see it. We discuss any large purchases in advance. The definition of a large purchase has changed over the years, but I’d say that the threshold is probably around $1000 now. For efficient tax planning, it’s important to understand how the Canada Revenue Agency (CRA) views ownership. For example, because our joint account holds money I earned, CRA views any income from investing this money as my income. Some people think that the income would be split 50/50 for a joint account, but this isn’t true. When we decide to retire, we’re better off financially if my wife and I have roughly equal-sized portfolios. But it does no good if I just give her a pile of money. CRA would just attribute any investment gains back to me. Our solution is that we don’t spend my wife’s income. It goes into her trading account to be invested. We use my income exclusively to pay household expenses. Whatever is left from my income gets invested in my trading accounts. The way we structure our bank accounts and trading accounts is designed to give us what we want from each of these three points of view. Our approach has worked well for us so far. Your mileage may vary. Author James Montier promises to show you “How Not to Be Your Own Worst Enemy” in his Little Book of Behavioral Investing. He does this by going through a number of interesting ways we tend to make investing mistakes. In addition to being very interesting, this book is concise; it packs a lot of useful information into 219 small pages. An experiment on willpower showed that hungry people who are made to resist eating cookies perform less well on a tedious task than those who were allowed to eat the cookies. Montier’s conclusion is that we have limited willpower and that “willpower alone is unlikely to be a sufficient defense against behavioral biases.” This may well be true, but another explanation for the experimental results is that we have less willpower when our blood sugar is low. In a disturbing experiment on anchoring with judges, experimenters had each judge roll a pair of dice to simulate a prosecutor’s request for the length of a sentence for a particular crime. The dice were loaded to give a total of either 3 or 9. The judges who rolled 3 chose an average sentence of 5.3 months, and those who rolled 9 chose an average sentence of 7.8 months. Even though the judges themselves rolled the dice and knew the total was irrelevant, they were strongly influenced by the dice total. Montier devotes a full chapter to confirmation bias. It’s hard to force yourself to seek out information that contradicts your beliefs. Fortunately for me, the stock market punished me enough (but not too much) that I had to admit eventually that I wasn’t a great stock picker. Now I buy index funds and do more interesting things with the time I used to spend poring over financial statements. The author gives a puzzle about confirmation bias. Four cards have a number on one side and a letter on the other. “The four face-up symbols are E, 4, K, and 7. I’m going to tell you that if a card has an E then it should have a 4 on the reverse. Which cards would you like to turn over to see if I am telling the truth?” Amazingly, 95% of fund managers get this wrong. If readers can avoid the overconfidence of thinking that Montier’s teachings don’t apply to them, this book will show them valuable ways they can avoid costly investment mistakes. Preet Banerjee interviews Dan Hallett in his latest podcast discussing The Financial Advisors Act of Ontario. My 1000-foot take on this act: it’s about weeding out unlicensed advisors and does nothing to address the systemic problem of the bulk of advisors hiding their fees from their clients and choosing ridiculously expensive products for their clients. The Blunt Bean Counter explains that CRA now expects those who earn income from a web site, even if it is just advertising income, to fill out a T2125 form reporting these business activities. I’m still trying to get my tax software to handle this for me. I expect to get this to work, but if I end up having to file on paper, I’m pretty sure I’m done with advertising on my blog. Potato has an interesting discussion on the regulation of financial advisors. I agree that the problems are systemic, but I’m not looking to the types of regulations that are designed to weed out a few bad apples. These things are fine as far as they go, but to handle the systemic problems requires a different approach. I think we need to cut off the funds flowing from funds to advisors. If advisors are performing a valuable service, their clients should be willing to pay them directly. The payment model doesn’t even have to change from the usual percentage of assets if clients are willing to pay that amount. A big benefit of this approach is that advisors would no longer have any incentive to recommend expensive funds. Remember that a 2.5% MER fund may only ship 1% of that to the advisor. The remaining 1.5% kept by the fund is a high cost with questionable benefit. Big Cajun Man warns that you should read your home insurance renewal documents. He found a note in his renewal that his coverage for water damage is not capped at $15,000. This is too low to be considered real insurance. Although it would be painful, I wouldn’t be devastated if I had to pay $15,000 to repair some water damage. If the insurance company only paid for the amount above $15,000, that would be insurance. Million Dollar Journey gives some insight into how Frugal Trader structures his personal finances with his corporation. taxpayers bear much of the investment risk taken by public-sector plans while the reward for risk-taking goes to public employees as higher compensation." I approach studies skeptically and am frequently critical of mistakes made by authors of studies, but not here. It is definitely worth paying attention to Hamilton. A thoughtful reader asked me about how Canadians can protect themselves against our dropping Canadian Dollar. I won’t name this reader because I intend to answer this question more forcefully and bluntly than usual. This may come across as wrath against this particular reader but that isn’t my intention. I want to shake up people’s thinking. Predictions abound that the Canadian dollar will drop in value relative to the U.S. dollar. This might be due to the overall economic forces, or maybe the election of PQ and the Neverendum issue. First of all, “Neverendum” is clever; kudos to whoever thought of it first. Next I have a message for the people of Québec: Don’t listen to the vocal minority in the rest of Canada. We love you. Please don’t go. Predictions about the Canadian dollar are worthless. Do you seriously believe that Canada’s current economic and political issues have somehow escaped the attention of the people who collectively risk not millions, not billions, but trillions of dollars in currency markets? Confident speakers can sound persuasive on either side of the question of which way the dollar will go. They’re going to be right half the time, but that doesn’t mean they have any useful insight. Suppose I say “heads and the dollar goes up, tails it goes down.” Then I toss heads and the dollar happens to go up. Does this mean I was right? Does it mean the coin was right? No and no. My prediction was worthless along with all the other smarter-sounding predictions. The sooner we all admit that we don’t know what will happen to the dollar, the sooner we can stop putting ourselves at risk of making foolish bets. Presumably sophisticated investors can protect against the dropping dollar. Maybe people planning a vacation in the U.S. and would like to protect themselves against a big drop in Canadian dollar. Sophisticated investors can make a bet that the Canadian dollar will drop. Unsophisticated investors can make similar bets. However, once you admit you don’t know what will happen to the dollar, you start to think about reducing uncertainty. This means that you reduce the risk of loss if the dollar drops, and you also give up the possibility of a gain if the dollar rises. Protecting against the downside while keeping all of the upside cannot be done. You can use certain types of derivatives to reduce downside volatility, but they have a cost. Anything that looks like insurance always has a premium to pay. It’s better for the typical person to think about lowering uncertainty rather than just eliminating the down side. Perhaps we could put cash in a U.S. dollar savings account at a local bank (and pay retail exchange rates). Or should people with a brokerage account buy a cross-listed stock and hold it in U.S. dollars instead of Canadian dollars? Now we’re on the right track. If you want protection against the uncertainty of holding Canadian dollars but having expenses in U.S. dollars, the solution involves holding assets that depend on the U.S. dollar. There are two separate issues here. One is how to keep exchange rates down when exchanging Canadian dollars for U.S. dollars. The other question is what assets you should hold. The key to currency exchange is to plan ahead so you don’t do it too often. It’s expensive enough to exchange some money once without bouncing the same lump of cash back and forth several times. The costs are hidden in the exchange rate. There is a gap between the rate you get going from Canadian to U.S. and the rate you get going from U.S. to Canadian. This gap means that a “round-trip” from Canadian to U.S. and back again leaves you with less money than you started with. No matter what method you use to do currency exchange, there will be an exchange-rate gap that costs you money. For small transactions, it’s hard to do much better than the rates you get at the big banks. However, for those with self-directed trading accounts, consider learning about the Norbert Gambit. What U.S. Assets Should You Hold? For near-term expenses, cash makes a lot of sense. U.S. dollar savings accounts or the U.S. side of discount brokerage accounts make sense. For snowbirds with longer-term expenses, consider assets like U.S. stocks and bonds. However, be sure that the assets you choose are actually depend primarily on the U.S. dollar. The specific example of using a cross-listed stock does not work. Take the example of Royal Bank stock. Whether you own RY on the TSX in Canadian dollars or RY in the U.S., you own exactly the same asset. You will be exposed to the same currency-related risks no matter which version of RY you buy. The particular currency you use to buy a stock isn’t necessarily the same as the currency that most influences the underlying business. Hidden currency exchanges: If your Canadian brokerage account only holds Canadian dollars, you may be paying currency exchange costs every time you buy or sell an ETF denominated in U.S. dollars. Proper Financial Plan: Make sure that whatever you own in U.S. dollars works with the rest of your assets to form a sensible and consistent financial plan. U.S. Estate Taxes: People whose entire estate (not just the U.S. part) is large enough can be subject to U.S. estate taxes on death. As with many things in life, making sensible choices about protecting yourself against the dropping Canadian dollar starts with understanding. The right course of action follows from that understanding. I’ve had some reader feedback about my recent post on debunking RRSP myths concerning realistic approaches to making RRSP contributions. Here I take a look at different ways to fairly compare RRSPs, TFSAs, and non-registered accounts. 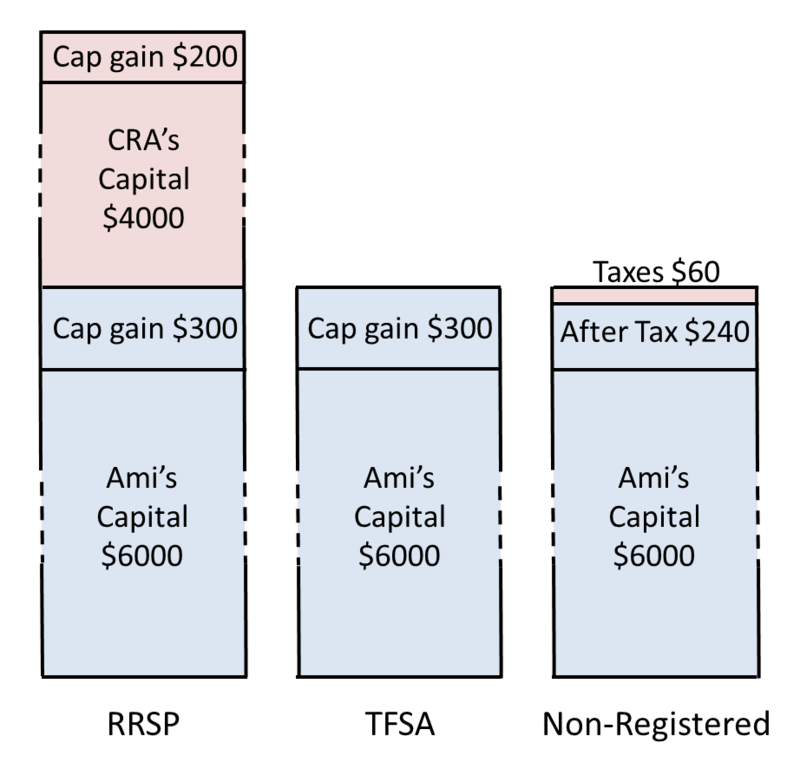 In the original post, my hypothetical investor, Ami, only had $6000 available to invest for the long term, but knowing that she was in a 40% marginal tax bracket, she made a $10,000 RRSP contribution and counted on the $4000 tax refund. Some readers think it’s more realistic to assume that Ami would only make a $6000 RRSP contribution, which is fair enough. 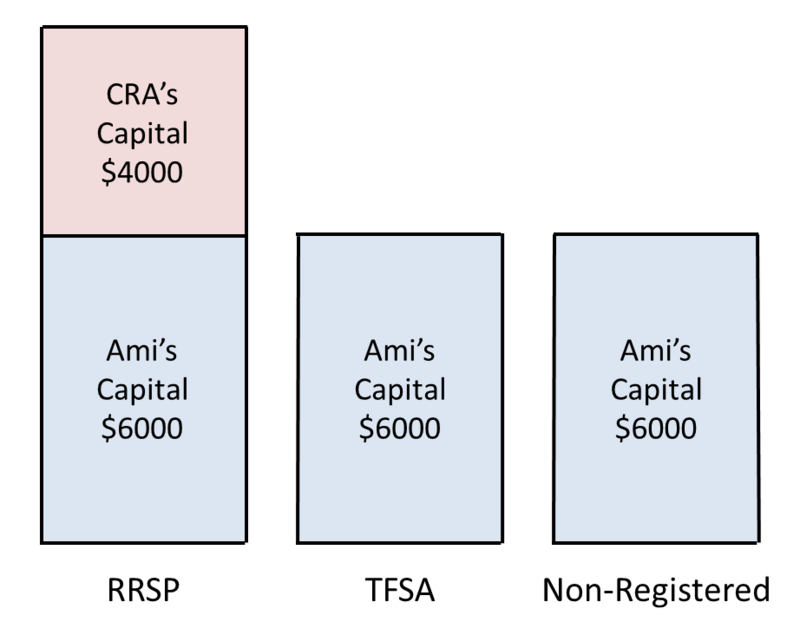 However, the $2400 tax refund that Ami gets from the $6000 RRSP contribution has to play a role in comparing this RRSP approach to investing the $6000 in either a TFSA or a non-registered account. With one way of handling the income tax refund, we could just assume that Ami puts it into her RRSP as well. But that’s not the end of it. Ami’s $2400 contribution next year generates a $960 refund the following year. When that amount goes into the RRSP, Ami gets another refund of $384 a year later. And on it goes with ever smaller RRSP contributions and refunds year after year. If you add up all the contributions until the end of time, it will add up to $10,000. Of course, Ami may find that she needs to spend the $2400 tax refund and doesn’t make an RRSP contribution the next year. In this case, she won’t contribute more than the original $6000 to her RRSP. If this is the case, then we need to amend the TSFA case to account for her spending needs. If Ami put the original $6000 in a TFSA and then needed $2400 the next year, she will have to make a withdrawal from the TFSA. In this TFSA case, we’re comparing a single $6000 RRSP contribution to a $6000 TFSA contribution, followed by a $2400 withdrawal from the TFSA the next year. So, the TFSA has a slight advantage over the RRSP of one year of returns on $2400. A non-registered account would have the same small advantage over an RRSP, but the tax drag on the non-registered account would be much higher than this small advantage. No matter what reasonable assumptions you make to get an apples-to-apples comparison, RRSPs and TFSAs give about the same results when tax rates are constant, and both are better than a non-registered account. Of course, irrational behaviour on Ami’s part could change everything. If Ami always wastes tax refunds on things she definitely would not have bought anyway, then RRSPs won’t work well. If she leaves RRSP savings alone but dips into her TFSA or non-registered account for wasteful spending, then RRSPs look best. If we go back to a mostly rational Ami, changing tax rates from when Ami is saving to when she retires is what dictates whether RRSPs or TFSAs are better. And non-registered accounts are almost never a better choice for long-term savings than whichever is better between an RRSP and a TFSA. I’ve got some good news. When you think in inflation-adjusted terms, you’re really paying more mortgage principal with each payment than you may think. The bad news is that home buyers these days have a punishing amount of principal to pay. When it comes to money, it’s important to think in inflation-adjusted terms. It’s easy to get lulled into the feeling that a dollar today is the same as a dollar was last year. But it isn’t the same. Dollars are leaky; it takes more of them to buy the necessities of life each year. The leak is slow enough that we don’t feel it every day. Fortunately, the leakiness of dollars works to a borrower’s advantage. Suppose that you’ve just taken on a $250,000 mortgage at 3% interest. Amortized over 25 years, the monthly payment is $1183. After the first payment, the balance owing drops by $562. When we think in nominal terms (as though dollars are constant), we would say that your first payment was split so that you paid $621 in interest and $562 of the principal. This is the way the Canada Revenue Agency sees it. However, using the average inflation rate in Canada over the last 5 years of 1.73%, the inflation-adjusted mortgage principal actually dropped by $920 over the first month. This means your real interest payment was only $263; the remaining $920 of the mortgage payment was applied to the real principal. So, we see that even from the very first mortgage payment, you’re primarily digging into real principal. I would never say that your mortgage interest rate doesn’t matter, but it’s clear that it’s not the only consideration. The size of the mortgage is the big concern these days. There are persistent myths about the tax-inefficiency of RRSPs. Here I debunk these myths using pictures. Myth 1: It is more tax-efficient to earn capital gains in a non-registered account than it is to earn them in an RRSP. A typical justification for this belief is that in a non-registered account only half of the capital gains are taxed, but all of an RRSP withdrawal gets taxed. To explain why this is a myth, let’s enlist the help of a hypothetical investor Ami. Five years ago Ami bought a house on her own and was somewhat house-poor until a promotion and raise two years ago. Since then she has managed to build $11,000 in a savings account without adding any debt beyond her mortgage. Ami plans to use $5000 of her savings toward a used car this summer, but she wants to invest the remaining $6000 for the long term. She is trying to choose among an RRSP, a TFSA, and a non-registered account. Within the account, Ami intends to invest with a goal of earning capital gains. We’re going to run three different futures for Ami, one for each of these accounts. For the TSFA and non-registered account cases, the starting point is simply $6000 invested in each account. But, the RRSP case is different because Ami will be getting a tax break on her RRSP contribution. In the RRSP case, we have labeled the extra $4000 as belonging to the Canada Revenue Agency (CRA) because Ami would have to pay this much in taxes if she were to withdraw all the money from her RRSP. If we focus on just the money that belongs to Ami, she has the same $6000 in all three cases. In the TFSA, Ami now has $6300. The non-registered account has this much as well, but some of it will be taxed away when she sells her stock and realizes the capital gains. Canadians include half of a capital gain in their income. With a 40% marginal tax rate, Ami pays 20% taxes on capital gains which is $60 in this case. 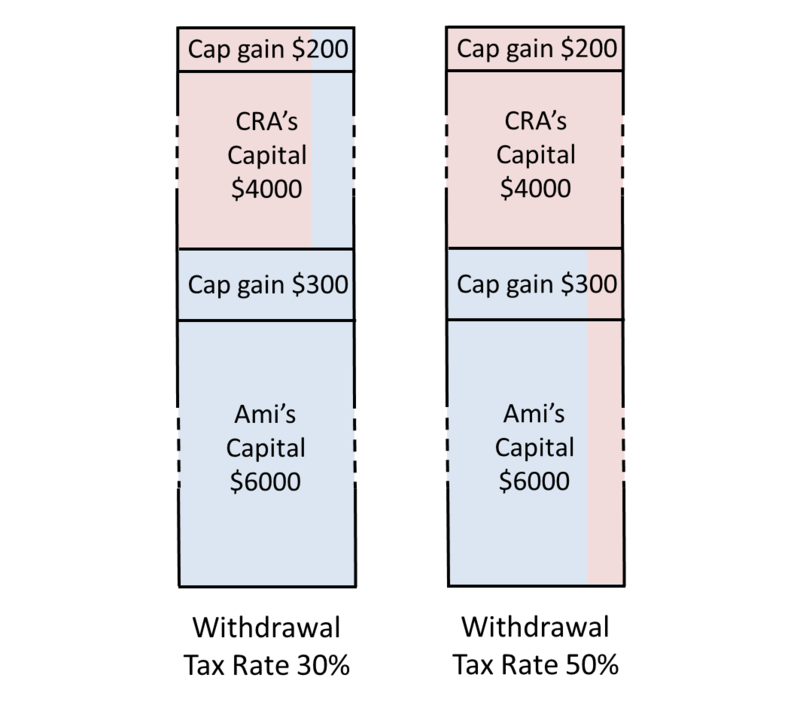 In the RRSP case, Ami’s share and CRA’s share each earn their own capital gains. Ami now has $6300 and CRA now has $4200. This makes sense because if Ami were to withdraw the entire $10,500, she would have to pay $4200 in taxes. If we compare each of the accounts, we see that Ami’s share of the RRSP is exactly the same as her TFSA assets. The only case that looks different is the non-registered account where income taxes have taken a bite. This shows it is not more tax-efficient to earn capital gains in a non-registered account than it is to earn them in an RRSP. It is tax rates that determine whether an RRSP or TFSA will work out better for Ami, but the drag of capital gains taxes in non-registered accounts makes them a worse choice than TFSAs and usually worse than RRSPs. Myth 2: It is more tax-efficient to earn dividends in a non-registered account than it is to earn them in an RRSP. The typical justification of this myth is that in a non-registered account, you get the tax break from the dividend tax credit, but all of an RRSP withdrawal gets taxed. This should look very familiar because it’s similar to the 5% capital gain case. The main differences are that Ami’s dividend taxes are slightly higher and they must be paid each year (capital gains get deferred until the gain is realized). This tax drag has a cumulative compounding effect that builds up very significantly over time. A TFSA is far preferable for dividends, and except for the most extreme cases of higher tax rates in retirement, a long-term RRSP is preferable to a long-term non-registered account. Once again, we find that the tax-efficiency of dividends in a non-registered account versus an RRSP is a myth. At their core, these myths come from the fact that RRSP savings get pumped up by tax refunds that people forget about, and they start to think of their RRSP balances as entirely their own money. Unlike TFSAs and non-registered accounts, RRSP deposits aren’t entirely your own, but you get higher RRSP balances for the same out-of-pocket contribution. Some of my readers ask why I bother with ETFs when I could save the MER costs and buy the index stocks directly. For example, instead of owning the popular iShares index fund XIU, why not save the 0.18% per year and buy the 60 Canadian stocks that make up the index this ETF tracks? The short answer is that replicating XIU cheaply is difficult. Let’s look at a fictitious example. Dan has a sizable portfolio. His allocation to XIU is $500,000. This fund’s MER of 0.18% costs Dan $900 per year. With such a large portfolio, Dan seems like a good candidate to try buying the TSX 60 stocks directly to save some of that $900. Let’s assume that Dan’s XIU shares are all held in tax-sheltered accounts, such as RRSPs, RRIFs, or TFSAs, so that we don’t have to worry about capital gains taxes. We’ll also assume that Dan pays only $5 per trade and that the spreads on TSX 60 stocks average one cent lost per $50 traded (0.02% per trade). If Dan wants to own all 60 stocks in exactly the right proportions, he will have to make 60 trades (not counting the initial sale of XIU). This will cost Dan $300 in commissions and another $100 in spreads. Even if Dan has his money split across multiple tax-advantaged accounts, he can just own a different subset of the TSX 60 in each account. So, the initial cost is $400. Whenever Dan adds new money to his accounts he will have to make 60 trades if he wants to maintain the correct proportion of each of the 60 stocks. This is another $300 in commissions and a small amount in spread costs (assuming the deposit is relatively small). Dan will incur the same $300 in commission costs whenever he makes a withdrawal. There is the added complication that the account he is withdrawing from may not have any shares in one of the stocks. This will force Dan to sell more of a different stock and then make two trades in a different account to get back in balance. So, withdrawals could easily cost Dan closer to $400 in commissions. Depending on how often Dan makes contributions or withdrawals, trading costs might add up to more than the $900 per year Dan is trying to save. Another source of costs for Dan is changes to the TSX 60 index. For example on 2013 June 24, the weight of Valeant Pharmaceuticals increased in the TSX 60 index. To account for this, Dan either has to add new money to his accounts to buy more Valeant, or he has to sell some of each of the other 59 stocks to buy more Valeant. The cost for this is about $300. Dan also owns some bonds and some U.S. stocks along with his Canadian stocks. He has target allocation percentages for each of these three categories. He finds that he doesn’t have to rebalance often, but when he does, he gets hit with another $300 in commissions for changing his allocation to Canadian stocks. An obvious way for Dan to save on costs is to be a little flexible about owning the 60 stocks in exactly the correct proportions. The problem is that this has a cost, even if this cost is not visible. For example, Dan might choose to own only the 20 biggest stocks instead of all 60. This will instantly cut his trading costs by two-thirds. Unfortunately, this will slightly increase the volatility of Dan’s portfolio which leads to volatility losses. This might seem like a small effect, and it is, but we are comparing it to a small MER of 0.18%. Under one set of assumptions, the volatility losses amount to 0.06%, or about $300 per year. If Dan is clever, he could examine all these factors and find an optimal strategy that minimizes the total of all these costs (commissions, spreads, index changes, rebalancing, and increased volatility drag). This strategy would involve following the index fairly closely, but not so closely that Dan has to make a lot of trades each year. Let’s suppose that Dan manages to find a strategy that is expected to cost him only $700 per year instead of the $900 XIU is charging him. Exactly how much work should Dan do to save this $200 per year? Personally, I’d much rather just buy XIU and spend more time with my family and friends. On the subject of what I like to buy, I like Vanguard’s VCN as a replacement for XIU. VCN is more broadly diversified and has a lower MER. It is difficult to replicate stock indexes at lower costs than the MERs of the best index ETFs. It would likely take a multi-million dollar portfolio and a complex strategy to get total portfolio costs below these MERs. And even then, a complex strategy would give only slight savings. Why bother? I prefer to just buy the best index ETFs. Dan Solin has some strong opinions about dividend stocks backed by historical evidence. Susan Eng discusses 10 dumb things people say about pensions. She makes a lot of good points in the first 9 items, but she loses me on her top “dumb thing people say about pensions.” Apparently, instead of cutting down MP and civil servant pensions, we should be fighting so that we all get equally-good pensions. This is hopelessly impractical. If we all retired in our late 50s, there wouldn’t be enough people left to do the work to keep our economy going. There just aren’t enough younger people to make food, run stores, manicure golf courses, and provide all the other goods and services retirees would want. Rob Carrick has a spreadsheet to help you decide if you can really afford to buy a house. It’s dangerous to rely on a bank to tell you what you can afford. Rob’s spreadsheet is much more realistic. One part of the spreadsheet is a little confusing. Unless it’s been changed already, the home maintenance cost you enter says to divide by 12, but don’t do this because the next line on the spreadsheet does it for you. Canadian Couch Potato explains why currency hedging doesn’t work in Canada. I come at this from a different direction. The notion of absolute returns is an illusion. Nominal returns of stocks are really a measure of how much more the stocks rose than the value of some currency. Why does it make sense to pick some particular currency to measure a particular stock’s return and call that return an absolute return? Most stocks and investors are affected by changes in the values of many currencies around the world. It makes no sense to declare one currency the “right” one to measure a stock’s absolute return. Currency hedging is little more than creating a strange investment that marries a currency bet with a stock investment. Mr. Money Mustache explains why we are not all doomed. I’m amazed at how so many people who are entering retirement age are so sure that the world was a better place when they were young. It wasn’t. I understand that they liked being young. But when we factor out changes in age, life is better today than it was in the 60s. Mr. Money Mustache takes a run at explaining this fact. Big Cajun Man wonders why we don’t dread debt more. I think the answer is that once we’re in debt, we can’t get out quickly (short of committing a robbery), and people tend to get used to things they can’t change. Million Dollar Journey is getting very close to the end of that journey. In fact, if you make the accounting less conservative for a defined-benefit pension plan and the principal residence, no doubt the million-dollar mark has already been reached. What’s next? The Blunt Bean Counter has some tips for getting prepared for the 2013 tax season. Many people struggle to understand RRSPs. I’m going to try a different approach to explain how RRSPs affect taxes. This explanation is based on the idea that the Canada Revenue Agency (CRA) becomes a partner in your RRSP investment venture. If you put $10,000 into an account, you think of it as entirely your own money. If it is a regular non-registered account, you’ll have to pay income taxes on any gains, but the original $10,000 is your money. Things aren’t so simple for RRSPs. Let’s suppose that you’re in a 40% marginal tax bracket. This means that each added dollar of income you earn costs you 40 cents in incomes taxes. If you put $10,000 into your RRSP, you get to deduct $10,000 from your income, and your income taxes will go down $4000. But this isn’t free money; CRA just became your partner. With that $4000 refund from CRA, they bought partial ownership of your RRSP. You can think of this as similar to running a business and selling part of it to a partner. Sometime in the future you will start drawing money from your RRSP (or RRIF if you’ve rolled it over). At this point, your partner, CRA, will want their share. Even though you can barely remember getting your tax refunds and have long since wasted them on electronic gadgets or clothes, CRA is still your partner and expects its cut. One important difference between your RRSP partner and a business partner is how we determine the percentage of ownership. In a business venture, if you put up $6000, and your partner puts up $4000, typically you get 60% of any eventual profits and your partner would get 40%. RRSPs work differently. The price CRA pays to become your partner is based on your marginal tax rate at the time that you take the RRSP deduction. This was 40% in the example above. But the amount that CRA gets on a withdrawal is based on your (effective) marginal tax rate when you make the withdrawal. So, if you take deductions with a 40% tax rate, but make withdrawal with a 30% tax rate, CRA pays for 40% ownership of your RRSP but gets only 30% of the spoils. This is a good deal for you. However, it can work the other way around as well. If your income is so low in retirement that you collect the Guaranteed Income Supplement (GIS), your effective marginal tax rate can be 70% or higher. This means that CRA gets a bigger share of your RRSP than they actually paid for. How you and CRA fare all comes down to the difference between your tax rate at the time of taking the RRSP deduction vs. your tax rate at the time of withdrawal. All this is why low-income Canadians with low income tax rates are often better off investing their savings in a TFSA rather than an RRSP. For someone with tax rates the same while working and in retirement, TFSAs and RRSPs will work out roughly the same. RRSPs have the added twist of being better or worse than TFSAs depending on how tax rates change from working to retirement. Keep in mind that both TFSAs and RRSPs are a great deal for long-term savings compared to non-registered investments because TFSAs grow tax-free, and your share of RRSPs also grow tax-free. The drag of paying taxes on gains in a non-registered account builds up significantly over the long term. So, the next time you hear retirees whine about having to pay taxes on RRSP or RRIF withdrawals, you’ll know that they took on CRA as a partner whether they realized it or not, and that they had the benefit of tax-free growth on their share of the RRSP savings. This was my way of using humour to poke fun at the absurdly high price of gold. But you may wonder if this statement is literally true. What dollar amount of gold fits in a backpack? Combining all this together, we find that a backpack hold $16.5 million worth of gold! Although I don’t like to talk too much about my exact net worth, I’m prepared to reveal that I have less than $16.5 million. So, my net worth in gold does, in fact, fit in a backpack. If you find it crazy that people are willing to pay this much for a modest-size hunk of metal, I’m with you. Some might think I’m cheating here because the weight of this much gold is 851 pounds. So, while it fits in a backpack, I certainly couldn’t lift it. However, $1 million worth of gold would only be about 52 pounds and would be a little larger than a 1 liter carton of milk. So most people are capable of lifting their new worth in gold. If you were to win a million dollars, you could get a nice house in a large Canadian city, a huge house outside the city, or a 52-pound lump of yellow metal. Your choice.